Want some cool custom art from me? All prices are per character and fullbody. If you have something different in mind or want to add more characters, we can work it out through messages. I am more than happy to draw NSFW work (barring underage characters and a few fetishes that make me uncomfortable). You can see more examples of all of these here on my deviantart or my portfolio site. 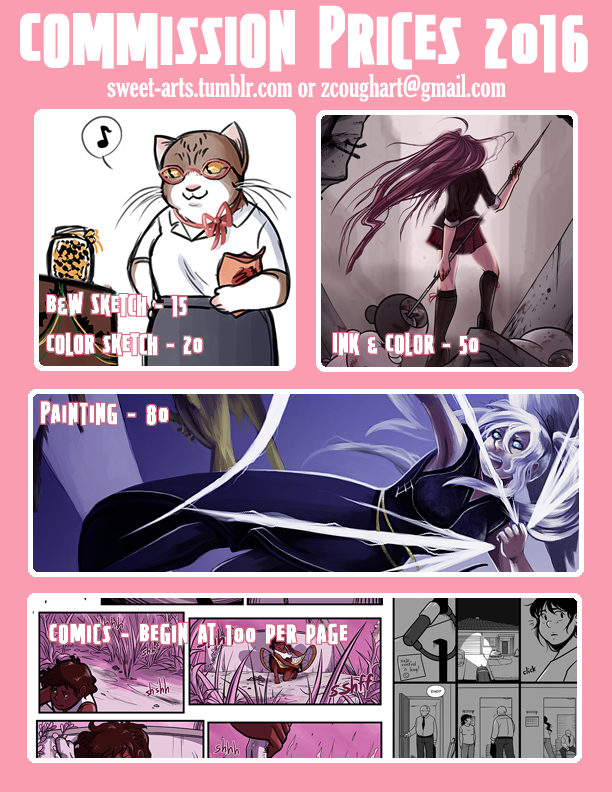 To order a commission, simply email me at zcoughart@gmail.com. You can also support my patreon, and certain reward tiers will get you a free one-time commission. All I ask is that you consider continuing your support afterwards. You’ll get to see all my work before anyone else, and I’m starting up backer request streams again so patrons can get more free sketches in the future.